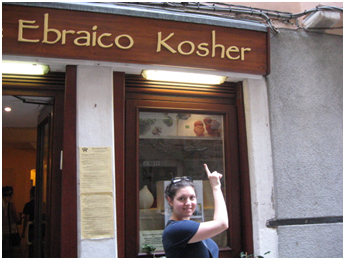 One common thing witnessed in the Jewish Ghetto of Venice was restaurants advertising kosher foods. Many of the identified Jews in shops such as these were Orthodox. 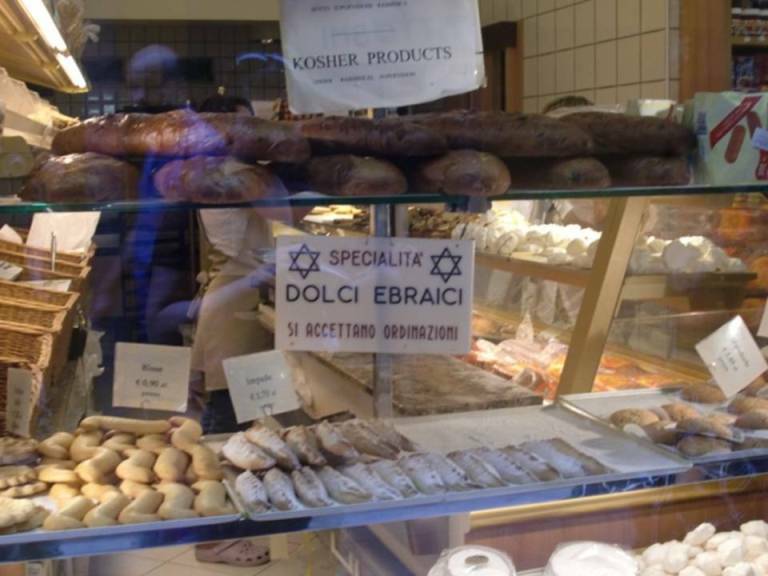 In the pastry shops that were listed as kosher, they looked very similar to items found in other Italian pastry shops. I believe I did see unleavened crackers in one shop, which of course isn’t a regular item in Italian bakeries. 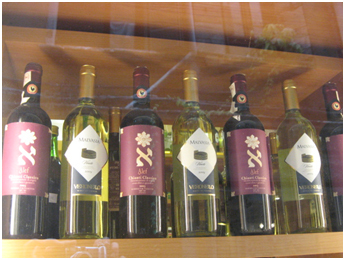 I liked how even in the shops there was plenty of wine, but it was easy to find wine bottles with Hebrew characters and clearly identifiable as kosher. I also saw the grape juice that I often see on Jewish tables during the holidays. I also saw a large amount of Middle Eastern food in this neighborhood, like Israeli food, as seen here. 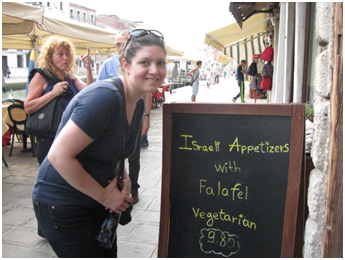 This is the first time I have seen Falafel (a favorite Middle Eastern food of mine) in Italy. The Star of David was seen on many signs, and was one of the clues to the group that we were in the Jewish Ghetto. It was the first time I had seen more Stars of David that crosses in Italy. This was very difficult. 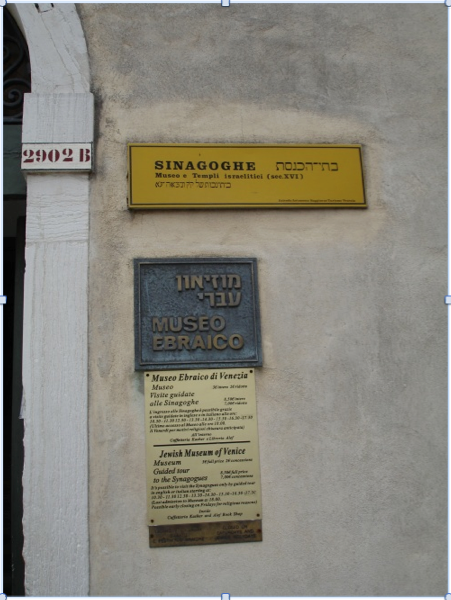 It took much longer than I figured to walk from the hospital to the Jewish ghetto, I would guess over an hour. If someone had a heart attack, I would assume that they would know the way from their location to the hospital, so it would take much shorter to walk there. 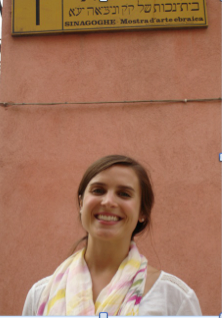 My group had a difficult time finding the ghetto, so imagining one of us in need of a medical treatment needing to get to the hospital seemed overwhelming, though I felt like we used a fairly straightforward way of getting there. One surprisingly thing about the hospital was how beautiful it was. It was very open and airy on the inside. This is me near the sign pointing to the synagogue. I was very shocked to see Hebrew writing because this was the first time I have seen in Italy a religious establishment that was not Catholic. 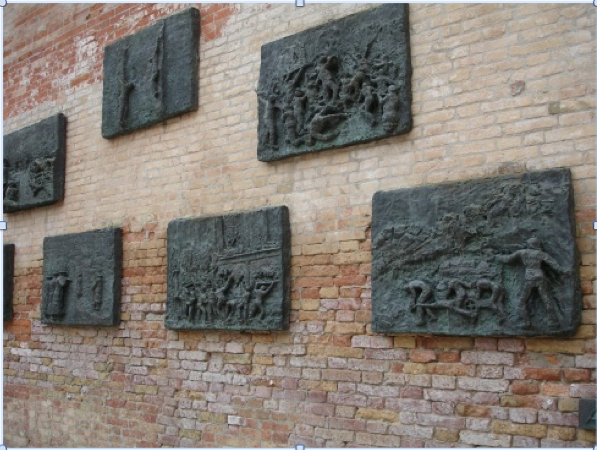 This was a graphic memorial in the piazza of the Jewish Ghetto. The scenes are very gory and graphic depicting the cruel treatment that Jews received during the war. This imagery added to my unease about entering into this community. 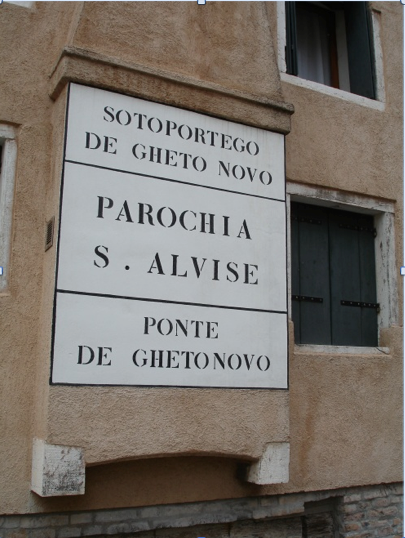 This was the sign and bridge indicating the area designated as the Jewish ghetto. This area was very separate and clearly indicated which made me feel like these individuals are their own separate group distinct from other Venetians. This picture was taken outside of the museum. The piazza that the museum was found in was distinctly Jewish, with all of its signs, monuments, restaurants, and other establishments clearly indicating this. I actually felt very out of place as if I should not be entering the community without permission. 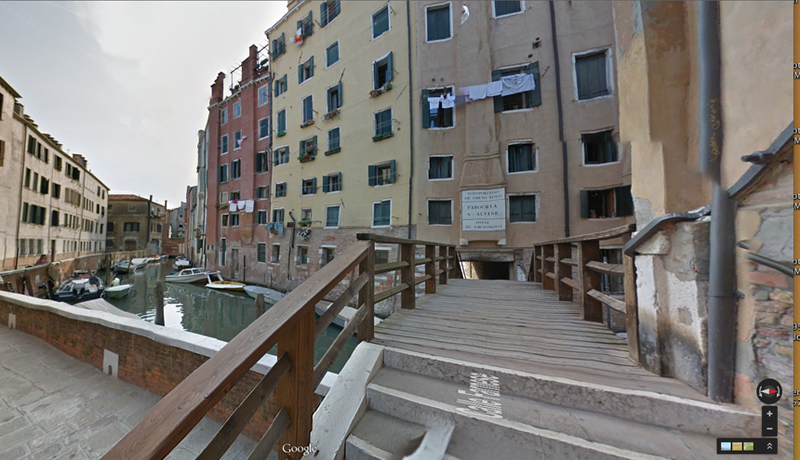 The Jewish Ghetto is located a good distance away from the hospital which would make it very hard for Venetians to easily travel there. The route we traveled from the Hospital to the Ghetto was fairly direct but still took quite a bit of time on foot. If someone were having a heart attack, the route my group took would not be fast enough. A boat ride through the canals or a helicopter would be much better alternatives if they were available.